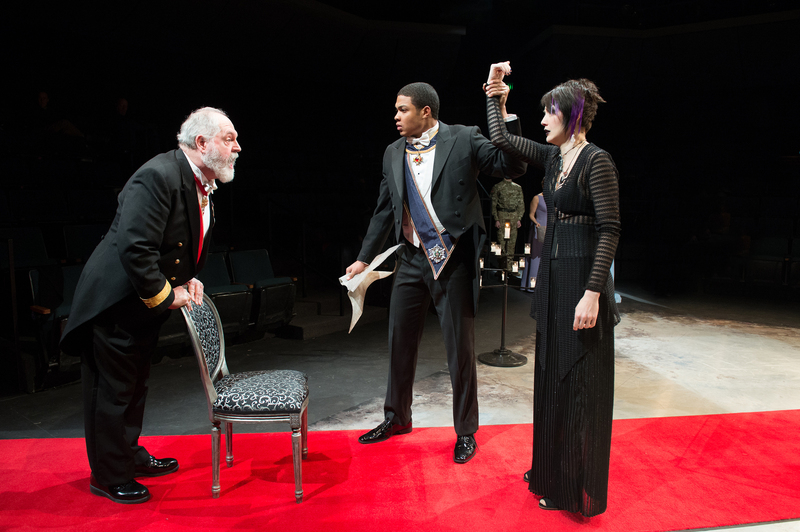 Michael Winters as Lear (Left), Ray Fisher as Burgundy (Center), and Sofia Jean Gomez as Cordelia (Right). Photo by Jenny Graham and courtesy Oregon Shakespeare Festival. In my sophomore year of college, I took a course on Shakespeare’s tragedies, taught by Santa Clara University’s resident Shakespeare scholar, Dr. Judith Dunbar. The class was enlightening, and I believe its greatest effect was that it introduced me to the intricacies of one of Shakespeare’s finest plays: King Lear. Oregon Shakespeare Festival’s production, starring Jack Willis and Michael Winters as Lear in alternating performances, more than does the play justice. My tickets were booked for the Michael Winters performance. Winters played Lear as a congenial, pleasant man, making his sudden fury towards his daughters and his eventual madness extremely unsettling. From what I heard, Willis played a mean, intimidating Lear; considering his prior performances as Lyndon Johnson in All The Way and evil monk Fahai in The White Snake, I'm sure that he performed the role as superbly as Winters. The play is held in the black-box Thomas Theatre (previously known as the New Theatre). Though they are not as spacious or grand as proscenium theaters, the benefit of black-box theaters is their intimacy and potential for versatile staging. Artistic director Bill Rauch used these qualities to their utmost limits in King Lear, staging scenes in the catwalks above the stage and producing the storm scene using stagehands with leafblowers and flashlights. (It looks much, much better than it sounds). Particularly innovative is Daisuke Tsuji’s Fool, which – due to the desire not to spoil the artistry for you – I will not describe in great detail. Similar to last year’s Troilus and Cressida, there is a military theme to King Lear’s design – when we first see him, Lear is wearing a general’s jacket covered in medals, and Edmund wears a soldier’s uniform for most of the play. Also like Troilus, we get a sense of both the depraved excess of the military upper class and the desolation of war, but Lear has a less narrow focus on the front lines, moving around to the streets and back alleys where Lear slowly descends into madness. Whether this is your first Lear or your hundredth, there is something to be gained from the Oregon Shakespeare Festival’s 2013 King Lear. Make sure you know which Lear is playing when you purchase tickets – though both are great, it’s good to be able to decide between “Nice Lear” and “Mean Lear”.